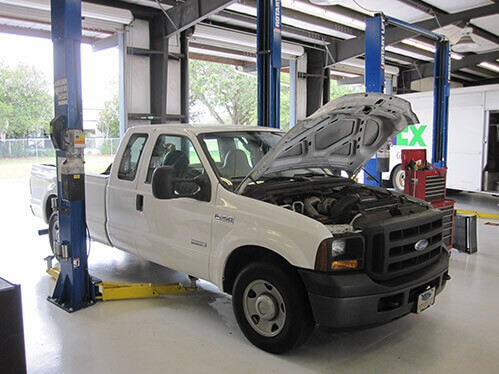 Welcome to Williams Diesel Service, a full service diesel repair facility serving North Central Florida for over 30 years! We offer a wide variety of parts and services to meet your diesel needs. Our friendly knowledgeable staff and factory-trained technicians are second to none with more than 200 years of combined experience. From rebuilding the injection pump on your farm tractor to making repairs to your light duty diesel pick-up, Williams Diesel Service has it covered. Williams Diesel Service is a proud and long standing member of the “Association of Diesel Specialists” and has received the “Four Star Achievement Award” in diesel service excellence from the Robert Bosch Corporation. Through continuous training and new test equipment we have the knowledge and skills needed to provide high quality repairs for our customers. We are also the dealer for many of the fuel system manufactures on yesterday’s and today’s vehicles and equipment. Our parts department is well stocked with parts and components to meet your diesel needs, from injection pumps and injectors to fuel conditioners and vehicle sensors! We've Got Equipment and Experience You Won't Find Anyplace Else. Williams Diesel Service is a proud and long standing member of the "Association of Diesel Specialists" and has received the "Four Star Achievement Award" in diesel service excellence from the Robert Bosch Corporation. Stop by, call or easily schedule your appointment online today to see why customers have been trusting them for years!